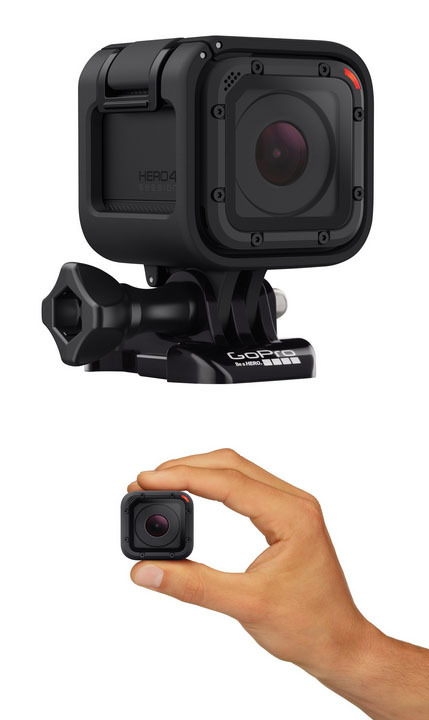 The GoPro HERO4 Session Camera is the smallest, lightest GoPro yet. It features easy one-button control to power up and capture videos or stills with one press. The camera captures 1080p60; 720p100; and 1440p30 video. This camera is waterproof down to 33 feet so it does not require an additional housing like other GoPros. The camera is about an inch and a quarter cubed, or about the size of an ice-cube. It weighs only 2.6 ounces. The Session is compatible with more than 30 GoPro accessories including helmet, chest, board, bike, gear and pole mounts. The HERO4 Session is also Bluetooth and WiFi enabled. The new shape gives the camera more flexible possibilities. The included frames take advantage of the cube design. However you attach the frame’s mount on the top, bottom, left or right, just position the camera so it’s right-side up. You can also mount it upside down and when you do the camera automatically flips the video when recording begins. The new microphone design delivers better wind-noise reduction. But it has a built-in battery. That means you can’t slap a fresh battery in and keep shooting. You will have to stop and charge the battery. To change settings on the camera, it needs to be wirelessly connected to an Android/iOS device or a GoPro remote. Despite these complaints, it is an excellent POV camera. The camera is available now from Amazon. Check out the GoPro HERO4 Session now.